Former Lagos state governor and National leader of the All Progressive Congress (APC), Asiwaju Bola Ahmed Tinubu, has slammed the immediate past administration of Dr.
Goodluck Jonathan for looting the country’s public funds. He condemned the lack of political will to fight the Boko Haram insurgency during Jonathan’s administration, adding that Boko Haram would have wrecked more havoc had Jonathan remained in power. He likened the capital flight under Jonathan’s leadership to the speed of legendary Jamaican runner, Usain Bolt, adding that such embezzled money could have been used to develop the nation’s economy. Tinubu made the submission in his capacity as the keynote speaker at the presentation of a book titled: “Making Steady, Sustainable Progressive for Nigeria’s Peace and Prosperity: A mid-term scorecard on the President Muhammadu Buhari Administration”, held at the State House Conference Center, Abuja. 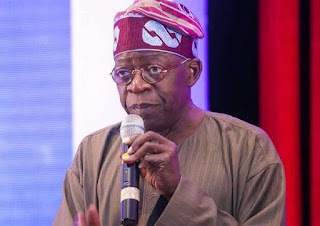 According to Tinubu, “the prior government used the public treasury as a private hedge fund or a charity that limited its giving only to themselves. “One minister and her rogues’ gallery picked the pocket of this nation for billions of dollars. While poor at governance, these people could give a master thief lessons in the sleight of hand. In governance, they earned a red card but in corruption, they won the gold medal. “It was not that our institutions had become infected by corruption. Corruption has become institutionalised”. The former Lagos State governor also commended President Muhammadu Buhari’s efforts at tackling corruption since he resumed office in 2015. “We have much to do to combat this disease. Not only must we track down the takers. In the long term, we must review the salaries of public servants and create universal credits for our people to reduce temptation.” He added.